What Makes the Best Heated Driveways? 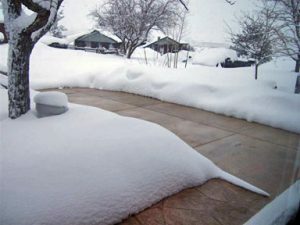 What are heated driveways and how are they installed? How do snow melting systems work, and do they require any maintenance? How versatile are heated driveways in terms of custom installations and different mediums? Heated driveways utilize radiant heat through a series of heating elements embedded in the driveway that warm the surface and prevent snow and ice buildup. The two basic types of radiant heat technologies are electric radiant heat and hydronic heat. Both technologies can be used in a variety of snowmelt applications, ranging from heated driveways, sidewalks and ramps to loading docks, bridges, and even on ship decks. Warmzone electric heated driveways are maintenance free and fully automated. These snowmelt systems can be installed in virtually any typical medium, including concrete, asphalt and pavers. Electric heated driveways utilize three major system components: The heating element, an activation device, and controller/control unit. What makes Warmzone snow melting systems an industry leader is the uncompromising quality of each component. Warmzone’s ClearZone heat cable is a rugged, industry recognized cable that is easy to customize and install. The cable can withstand the stress of fresh concrete pours as well as the extreme temperature of hot asphalt installations. The ClearZone cable is UL listed and consists of a twin conductor with FEP/XLPE insulation, polyolefin jacketing (providing flexibility and UV protection). The heat cable is rated at 220°F and has a minimum 10-year warranty. Given its durability and reliability, ClearZone heat cable is a favorite among construction professionals. Warmzone snow melting systems use either an aerial-mount or pavement-mount activation device (snow sensor). When the snow sensor detects precipitation and temperatures are below a set point (usually 39°F), it signals the controller to activate the system. Warmzone offers several types of snow sensors to meet the specific demands of your project. The aerial snow sensors feature adjustable temperature trigger points, adjustable delay off cycles, and upgradeable remote activation. The activation device is also smart system compatible. The pavement-mounted snow sensor is mounted directly in the driveway or sidewalk being heated. These sensors are typically used in large commercial applications, while most residential snow melting systems feature an aerial-mount activation device. The Warmzone snowmelt control unit used with the pavement mount snow sensors are small, NEMA 1, wall-mounted control panels. These efficient controllers are approximately 6×3.5 inches. The units have even been designed so that they can be controlled from an external signal (day/week timer, GSM-module or other signal source). The compact snow melting control unit can be switched on/off (standby) and the heating system can be manually turned on in case wind causes snow drifts or ice forms in the shade. Contact a radiant heat professional at Warmzone today (888.488.9276). Warmzone also offers free installation training. For more information about our training courses, call us at 801.948.7545. Warmzone offers a wide variety of floor heating solutions. Unlike many providers, Warmzone manufactures its own premier products and carries industry leading solutions from other top manufacturers. In addition to providing premier floor heating elements, Warmzone also offers the most reputable system controllers and thermostats, including the latest, state-of-the-art WIFI Touch Thermostat. • Sleek design and intuitive control designed for easy installation. • Universal compatibility with existing floor heating sensors. 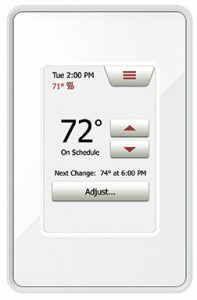 Thermostat use based on a touch color screen is smart and easy. An entire screen is designed for every action, and therefore programming, schedule override or setting up becomes much easier for both installer and end user. Thermostat programming is now based on 6-event days copying one day schedule to any other day with a single operation. Any schedule override is just a touch away – until the next event, for a number of hours or days, in the future, or until next time you change your mind. The thermostat is delivered with a default schedule. Follow the thermostat power consumption in the energy log. Logging of the last 24 hours is saved in high resolution, but logging history is also stored in the thermostat. Power logging is easily stored to your computer by use of our QR technology. The thermostat settings and energy log can be monitored on any device with web access. Just scan the QR code from the thermostat and view the data on a web site. The new, smart and interactive manual details what you can do with the thermostat. The QR code can also be forwarded to a supporter, shortening downtime used on “what is” explanations and jumping directly to “what to do” time. Connect the wires, turn on the power and follow the wizard. There is no need to remember special settings, the thermostat pre-sets the installer wizard and the user wizard ensures a fast and smooth process. Thus, no unintended heating before you are ready. By default, the thermostat controls ambient temperature and protects the floor from overheating. The default floor sensor can be replaced by any floor sensor. The floor protection fits laminate/wood, tile and concrete for whenever lower maximum temperature is required. You can conveniently program the heat to turn on and off at specific times to accommodate your schedule. Call Warmzone today and install your system with confidence. To learn more, call 888.488.9276 today. This was a fantastic article. I was not aware that advanced thermostat controls were available for radiant systems. On the phone now with Warmzone.